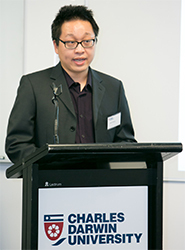 Semi-living pig wings and chemical alphabets will be among intriguing topics discussed during Charles Darwin University’s first major visual research conference in Darwin. More than 30 artists, scientists and other academics from CDU and across Australia will showcase innovative research projects during the three-day “Visualising Top End Research” conference from Thursday (8 September). Visual arts lecturer Dr Aaron Burton said keynote speakers included “biological art” pioneers, Oron Catts and Dr Ionat Zurr from the University of Western Australia’s SymbioticA artistic laboratory. Dr Burton said their use of biological lab processes to create confronting artistic works, including wing-shaped objects made from pig cells, reflected the power of visual representations of research. “Creativity has come to the forefront of scientific investigation over the past few decades,” Dr Burton said. He said the beauty of crocodile leather, organic solar cell design, and the true colour of the NT landscape would be among issues discussed at the conference. Other keynotes include internationally acclaimed researcher from RMIT Professor of Design Paul Carter, Associate Professor Tess Lea from the University of Sydney, Professor Helen Verran from the Northern Institute at CDU, and filmmaker Molly Reynolds. The event will include exhibitions by CDU visual arts students, screening of Another Country (2015) and films by the Karrabing Film Collective, and a video installation by artist Judy Watson. Mr Catts and Dr Zurr will deliver a presentation at the Science at Sunset event as part of the conference.